Where do you keep your Mac Pro? Discussion in 'Mac Pro' started by SteelBlueTJ, Jul 8, 2012. Inside my desk. Has a compartment large enough, and ventilated enough (no back on compartment) to let air pass through. I keep mine on the floor. I keep mine in my face. At all times. I don't want to put it on the floor under my desk due to dust. Mine sits on the floor and drinks in a load of dust. Every 6 months I open it up and use an air blaster to blow it out (blast from the inside out). 4 1/2 years old and still seems to be doing fine. Hackintosh is on the floor with the door off because my oversized heatsink won't fit with it on. Plus it allows more airflow to the graphics card. On the desk. It is easy to connect peripherals. Even to the back. on the desk at first where the dust could not get to it. Later a i built a standing workstation - kind of like a rackmount on wheels. Saves space because everything is stacked high, as opposed to being spread out on a desk. It is hinged to the wall and swings out for access to the back. Bought a high drafting chair to sit in, better for the knees for me - normal chairs are too small, i'm 6'6. On top of my desk to the right of my monitor. On floor. Once every 6 months to a year (whenever I think of it) I'll open it up and blow out dust and pull ram cards and blow them off. Mine is now 4 years old and never had a problem doing it this way. Too big for my desktop and would be too loud up top anyway. On my floor, because I'm apparently a bit of an idiot. I keep meaning to manufacture a wooden stand for it just to reduce the dust intake a little. As it stands, I open it up and blow it out from time to time, but this isn't the best approach for its lifespan. I have a friend that owns a custom cabinet business. He designed and built a very spacious & ergonomically correct desk for me. On the left side he built a special compartment that's a few inches wider & taller than the computer for free airflow. It's about 15" above floor level which is nice, it locates my Mac Pro off the floor at a nice height, not too high. I remove the computer on a regular schedule, open it & clean out any dust. By staying ahead of it, I don't have to deal with a major build up of dust & debris. I treat it like a work of art. Because it is. I had mine on the floor (carpet) for several years... big mistake! After I good clean out and with a new machine on the way I've got a low-line TV unit against the wall 90° opposite my desk. With another machine on the way both will sit neatly on there (although only just depth wise) with plenty of air, room for cable access etc. The only thing is I needed a DVI extension for my monitor to reach. On top of my desk, to the right of my monitors. Keeps dust to a minimum and allows me to open the side panel without bending down to do it. Looking for ideas on where to keep the Mac pro. I don't want to put it on the floor under my desk due to dust. I used to keep a PC tower in a special cavity (just off the floor) in a desk I used to have but removed it after a year after seeing how much dust it had collected. Later I had a G4 PowerMac on a coffee table at the end of my desk, about 40cm off the floor and room to dust around it. Now I place my G5 tower on the desktop but I have a big desk 180cm x 90cm surface area. 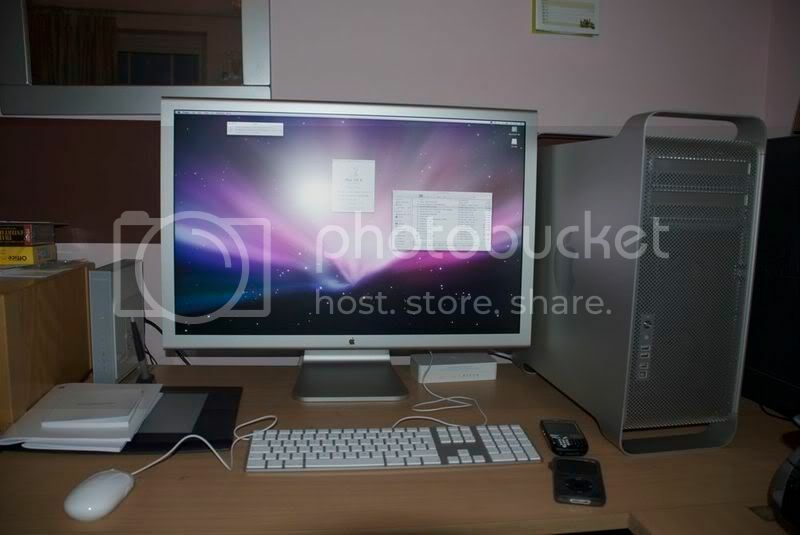 Soon I hope to get an iMac but the G5 will move to a new home well off the floor. On the left side he built a special compartment that's a few inches wider & taller than the computer for free airflow. It's about 15" above floor level which is nice, it locates my Mac Pro off the floor at a nice height, not too high. I remove the computer on a regular schedule, open it & clean out any dust. By staying ahead of it, I don't have to deal with a major build up of dust & debris. This is what I'd like to have.. I keep them on an adjacent desk but it's still up where I can hear it. Has intake filter and exhaust/cooling fans. Good flow, no overheating. Very quiet solution as well. also using a iso box for my mac pro and converters lol. Mine is on wheels under the desk for quick pull outs. Wheels from container store make it much easier than a drag or lift. X-frame dolly under the desk. Afraid to open it up to blow out the dust, it might attack. In a purpose-built air-conditioned machine closet, up off the floor on a shelving unit. Under my desk, on the left side for easy acces to the side panel. No carpet, no pets. Had my old Mac Pro there for almost 6 years without any problems. I cleaned it only once, right before I sold it. I recently added an air purifier to my office, so I expect even less dust.